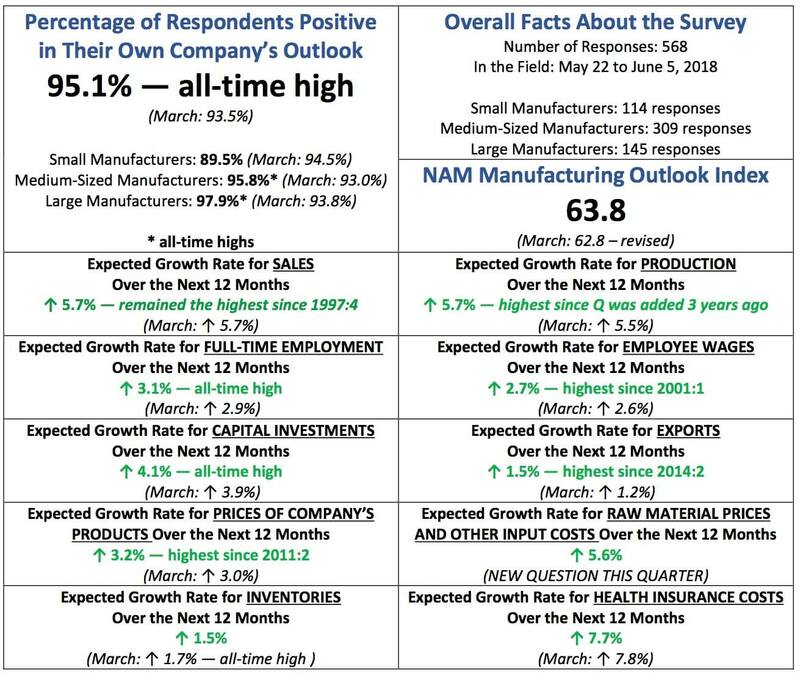 In the latest Manufacturers’ Outlook Survey from the National Association of Manufacturers (NAM), it is clear that businesses continue to experience highly elevated levels of activity as a result of pro-growth policies like tax reform, with optimism once again breaking records—95.1 percent of respondents were either somewhat or very positive about their own company’s outlook, the highest rate since the 20- year-old survey was introduced in the fourth quarter of 1997 (Figure 1). In general, those completing this survey have been upbeat since the end of 2016, averaging 92.6 percent positive over the past six quarters. Additionally, the Manufacturing Outlook Index also rose to an all-time high in this report, the seventh straight quarter where the outlook exceeded the survey’s historical average. Manufacturers also posted near or all-time high numbers in this quarter’s survey when it came to their expectations for hiring workers (highest ever), raising wages (highest since 2001), increasing investments (highest ever), and increased sales (second-highest ever) (Figure 3). Outlook measures for medium-sized and large manufacturers also reached an all-time high in this survey. Clearly, manufacturers continue to be upbeat following Washington’s passage of the comprehensive tax cuts package mentioned earlier as well as other positive policy changes out of Washington like its less- burdensome approach toward regulatory policy—pro-growth stances that will help manufacturers compete in the global marketplace. Along those lines, the “business environment” is no longer the concern that it once was, with just 19.1 percent citing the tax and regulatory climate as being a top concern (Figure 5). 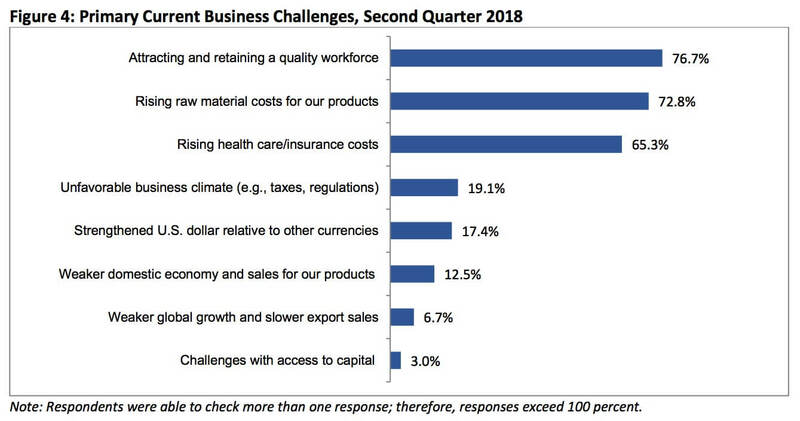 Respondents cited an unfavorable business climate as their primary business challenge as recently as two years ago, with three-quarters of manufacturers noting it as their top problem in the second quarter of 2016. This quarter’s survey found manufacturers citing instead the inability to attract and retain a quality workforce as their top concern; the price of raw materials rose to their second-most concern. 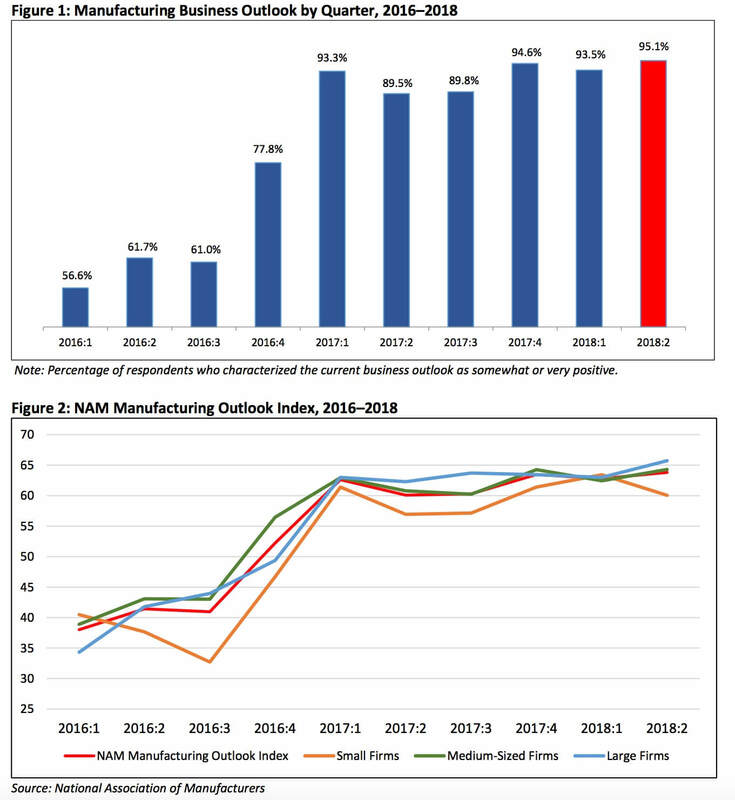 The NAM Manufacturing Outlook Index rose from 62.8 to 63.8, which was a new all-time high (Figure 2). Numbers greater than 60 indicate strong levels of optimism, with the percentage positive in their outlook more than one standard deviation from the historical average (74.5 percent positive). This was the seventh straight quarter where the outlook exceeded that average. Employment: Respondents expect full-time employment to increase by 3.1 percent over the next 12 months, up from 2.9 percent in the previous release. This was also a new all-time high. More than 66 percent anticipate more hiring over the next year, including 27.4 percent planning employment growth of 5 percent or more. Just 3.3 percent see employment falling for their firms. More than anything, this reflects an ever-tightening labor market.The fastest hiring growth is seen among medium-sized firms, which predict a 3.5 percent increase in employment over the next 12 months. In contrast, small and large manufacturers expect job growth of 2.8 percent and 2.4 percent, respectively. Wages: Along those lines, respondents anticipate employee wages (excluding nonwage compensation such as benefits) to rise by 2.7 percent over the next 12 months, inching up from 2.6 percent in March’s survey (Figure 4). This was the fastest pace in more than 17 years, or since the first quarter of 2001. In the latest results, 94.2 percent see wages increasing over the next year, with nearly 47 percent expecting to hike wages by 3 percent or more. This is consistent with other indicators that have shown wage pressures accelerating, but still at a modest pace. Capital Spending: Respondents expect capital investments to rise by 4.1 percent over the next 12 months, up from 3.9 percent in the past survey. This was another all-time high. More than 61 percent anticipate higher capital spending in the next year, with 23.9 percent of manufacturers expecting robust investment growth of 10 percent or more.Medium-sized and large manufacturers predict capital investment growth of 4.3 percent over the next 12 months, with small manufacturers anticipating 3.2 percent growth. Sales: Respondents expect sales growth of 5.7 percent over the next 12 months, unchanged from the last survey. This remained the fastest pace since the fourth quarter of 1997, which was coincidentally the first survey in this series, making it the second-highest level in the survey’s history and a more than 20-year high. In the latest results, 88.4 percent of manufacturers anticipate higher sales over the next year, with just 3.3 percent predicting declines. Roughly one-quarter see revenue gains of more than 10 percent.Medium-sized (those with 50 to 499 employees) and large (those with 500 or more employees) manufacturers had sales expectations of 5.8 percent over the next 12 months, which was better than the 5.0 percent anticipated sales growth seen for small firms (those with less than 50 employees). Production: Respondents expect production growth of 5.7 percent over the next 12 months, up from 5.5 percent three months ago. This question was added to the survey three years ago, and it is the fastest pace for output activity in that time span. Similar to the sales results, 86.6 percent predict production to expand over the next year, with 61.2 percent forecasting output growth of 5 percent or more. Just 3.7 percent of manufacturers anticipate reduced production. Inventories: Respondents expect inventories to increase by 1.5 percent over the next 12 months, off from 1.7 percent in the previous data, which had been an all-time high. It was the sixth consecutive quarter with anticipated growth in inventories. This mainly reflects stronger demand—another indicator of healthy growth for the sector. Just over 42 percent of manufacturers predict increased inventories, with 45.0 percent expecting stockpiles to remain unchanged. Product Prices: Respondents expect product prices to increase by 3.2 percent over the next 12 months, edging up from the 3.0 percent gain seen in March. This was the fastest growth rate for prices since the second quarter of 2011, or in seven years (Figure 4). Forty-seven percent of those surveyed forecast price growth for their products of up to 5 percent, with 26.2 percent predicting price growth of 5 percent or more. Raw Material Prices: Manufacturers anticipate raw material prices and other input costs rising 5.6 percent over the next 12 months, with 55.3 percent of respondents seeing price growth of 5 percent or more. This is a new question—perhaps a long overdue one, as it will allow firms to distinguish between expected growth in input costs, as opposed to the prices of final goods. As there is no history for this series, there is nothing to compare it to, but it seems highly elevated. Overall, the pickup in raw material costs is consistent with other measures of inflation. Exports: International demand remains strong on improved global growth. Respondents expect export sales to rise by 1.5 percent over the next 12 months, up from 1.2 percent in March. This was the fastest rate of expected growth since the second quarter of 2014. Nearly 43 percent of those taking the survey predict export sales increasing over the next year, with 52.8 percent seeing exports being unchanged and 4.5 percent noting possible declines.As we have seen in prior surveys, those companies that are more optimistic about exports tend to be the most upbeat in their overall company outlook. Along those lines, for those predicting increased exports over the next 12 months, a whopping 99.6 percent were positive in their outlook in this survey. That figure was 93.2 percent positive for those predicting no change in export sales over the next year, but it fell to 76.0 percent for those individuals saying that they anticipate reduced exports.Firm size also mattered on trade. Large firms were the most optimistic about export expectations, predicting 1.9 percent growth over the next 12 months. Small and medium-sized manufacturers predict 1.3 percent growth in exports. For the third straight survey, the inability to attract and retain a quality workforce was the top business challenge for manufacturers, cited by 76.7 percent of respondents (Figure 4). With robust job growth and an encouraging economic outlook, it has become increasingly difficult to find talent— something echoed in the sample comments. The second major business concern was the rising cost of raw materials (65.3 percent), up from the third top concern in the prior survey. This finding is consistent with accelerating input costs overall in other measures, including the producer price index and other sentiment surveys. The third greatest business challenge concerned rising health care costs (65.3 percent), with respondents anticipating that health insurance premiums will increase 7.6 percent over the next 12 months. More than 74 percent of manufacturers expect their premiums to increase by at least 5 percent on average next year. At the same time, roughly three in ten of those completing the survey expect their premiums to rise by at least 10 percent. Small and medium-sized manufacturers predict 8.3 percent growth in health care costs on average over the next 12 months, with large firms seeing 6.4 percent growth. This survey has been conducted quarterly since 1997, with the NAM’s membership submitting this quarter’s responses from May 22 to June 5. In total, 568 manufacturers from all parts of the country, in a wide variety of manufacturing sectors and in varying size classifications, responded this quarter. Aggregated survey responses appear below. The next survey is scheduled for September 2018. Manufacturers continue to be upbeat about regulatory reform and its economic impacts. Because of the regulatory moratorium last year, a dramatic shift has occurred in the federal rulemaking process, and manufacturers widely consider it a positive development. 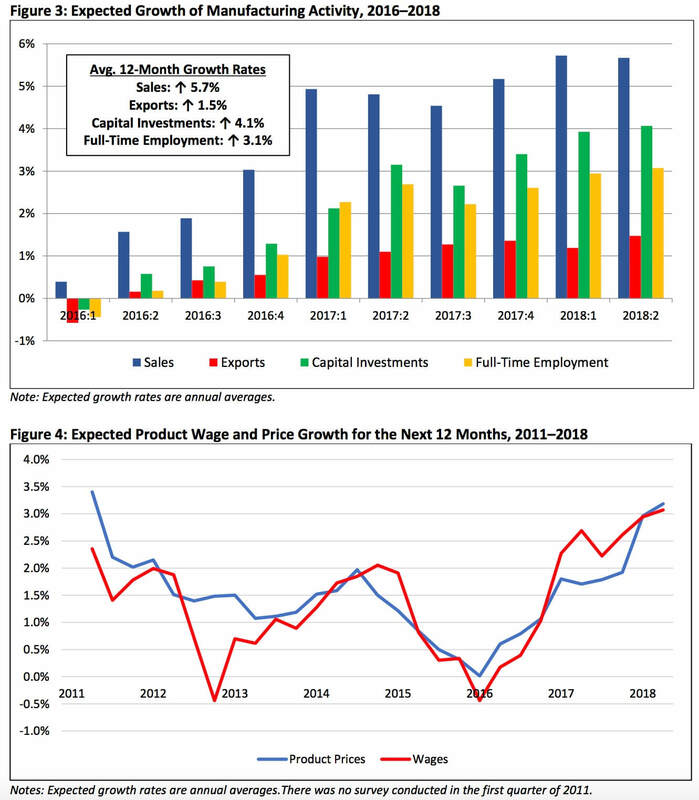 More importantly, respondents said that they were more likely to increase capital spending (49.0 percent), employment (45.2 percent), and wages and benefits (50.6 percent) as a result of the changed regulatory environment in Washington. The Trump administration has made apprenticeship programs one of its top priorities, which is important in light of the challenges described earlier. The Manufacturing Institute has worked with others in the business community, educational institutions and the military to build new avenues of access to the training and certifications that workers need to have successful, rewarding careers in modern manufacturing. In this survey, we asked questions about such programs to gauge general interest and discover how widely used they might be. Encouragingly, two-thirds of respondents said that they intend to increase apprenticeships, training and/or other mentoring programs or initiatives in the next year. More broadly, manufacturers continue to struggle in identifying new talent, especially with the labor market at or below what economists would call “full employment.” Indeed, recent data suggest that there are more job openings than people looking for work. This means that firms need to get creative, especially with their existing employees. When it comes to skills development, roughly 90 percent of those completing this survey said that they regularly train (or “upskill”) their existing workforce. Seventy-one percent of respondents had training programs of less than 12 weeks, with 41.8 percent having programs of 12 weeks or more. (They could pick more than one option if they had more than one program.) Only 5.1 percent said that they had no training programs, with the same number being unsure. Over the next year, what do you expect to happen with your company’s overall sales? Over the next year, what do you expect to happen with your company’s overall production levels? Over the next year, what do you expect to happen with raw material prices and other input costs? Over the next year, what are your inventory plans? Over the next year, what do you expect to happen to employee wages (excluding nonwage compensation, such as benefits) in your company? Over the next year, what do you expect to happen to health insurance costs for your company? What is your company’s primary industrial classification? What is your firm size (e.g., the parent company, not your establishment)? As a result of the changed federal regulatory environment, are you more likely to increase capital spending in your company? As a result of the changed federal regulatory environment, are you more likely to increase employment in your company? As a result of the changed federal regulatory environment, are you more likely to increase wages and/or benefits at your company? Does your company regularly train (or “upskill”) its existing workforce? Does your company intend to increase apprenticeships, training and/or mentorship programs or initiatives in the next year?